When we think of peak oil and how best to cut down on our fossil fuel consumption, most of us only think of transportation alternatives. But the fact is that producing plastics also uses up quite a lot of oil. Could finding an alternative to plastic be a solution to our dwindling oil supply? Researchers at the University of Tokyo think it’s a step in the right direction, and they think that their new invention could be just the alternative material we need. 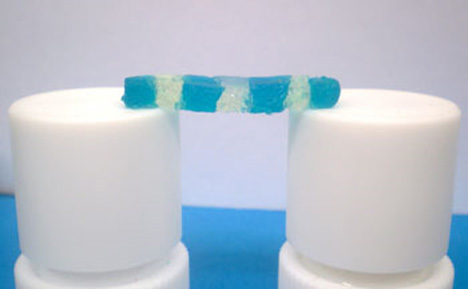 Takuzo Aida and his team created a hydrogel that’s strong enough to support itself on a self-standing bridge (see above), flexible and – maybe best of all – self-healing. 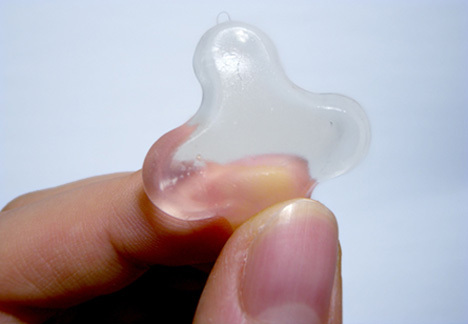 The material is composed of around 95 percent water mixed with small amounts of microscopic clay disks, sodium polyacrylate, and a special molecule called “G3 binder.” The gel is very easily formed and is ready to use within three minutes. The strength and elasticity of the material depend on how much of each component ingredient is included in the mix. Due to its high water content and ability to heal itself, the new material could be highly useful in tissue engineering and prosthetics. As of now, the components used are still derived from fossil fuels, but hopefully non-petroleum sources could be found to make the compound more environmentally friendly while maintaining its beneficial qualities. See more in New Materials or under Science. January, 2010.